It was another exciting weekend in Serie B with plenty of goals flying in around the country. The round up starts in Emilia-Romagna, as table toppers Carpi hosted lowly Cittadella at Stadio Sandro Cabassi. Carpi ran out 5-2 winners in a totally dominant performance to remain in top spot. Cittadella were four goals to one down at the break as Carpi ran riot. Defender Riccardo Gagliolo opened the scoring after 25 minutes with a thunderbolt from outside the area, then fellow defender Simone Romagnoli made it 2-0 with a fine header . Cittadella defender Filippo Scaglia pulled a goal back on 35 minutes after a hopeful punt forward resulted in a defensive mix up and he poked the ball home. Frosinone suffered a surprise loss at Pescara 3-0. The hosts totally dominated this game and ran out deserved winners. After a goalless first half the game came to life in the second when Federico Melchiorri gave hosts lead for his seventh goal of the season. He showed great strength to beat his man and burst into the box before slotting home. Riccardo Maniero made it two from the spot on 64 mins and Cristian Pasquato sealed win three minute from time with a superb strike from outside the area. 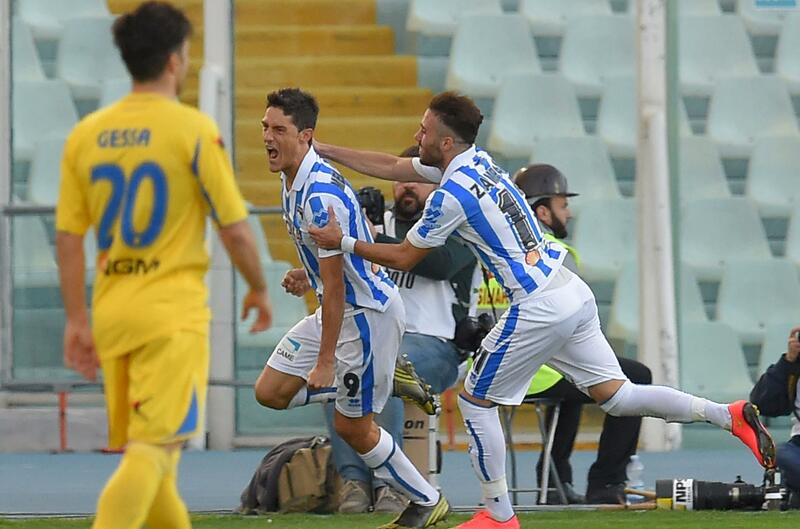 Pescara move upto 12th, and this surprise defeat sees Frosinone stay 2nd. Bologna suffered a defeat by two goals to one at home to Brescia. A big crowd of nearly 15,000 turned up to watch this game and things were going to plan when Daniele Cacia put hosts in lead, with his fourth of season. He reacted quickest to a parry from the Brescia keeper to put the hosts in front. Bologna were heading for a win until two goals in last 10 minutes from Brescia snatched the points. First veteran striker Andrea Caracciolo equalised, after heading home after a great cross into the six yard box, then Leonardo Morosini sealed the win with three minutes left. Again, the ball was crossed low into the Bologna area and Morosini swept the ball home. Bologna drop to 7th, Brescia upto 11th. Crotone continued their recent revival as they defeated Bari 3-0, who sacked Devis Mangia after the game and replaced him with ex Livorno boss Davide Nicola. Goals from Ciano, De Giorgio and Maiello sealed a valuable win. Crotone move upto 20th, whilst Bari drop to 15th. Elsewhere Avellino lost 1-0 at home to Vicenza , Latina defeated Virtus Lanciano by a goal to nil and Livorno ran out 3-1 winners against Pro Vercelli. There were draws between Ternana - Spezia (0-0), Trapani - Catania finished 2-2 and Varese - Perugia finished 1-1. Virtus Entella v Modena was postponed due to a waterlogged pitch, due to heavy rain in the Liguria region.